Please click on the PayPal button below to order the book if you are interested. If you are interested in buying a PDF version which you can download immediately, please click on the cover. If you'd rather pay by check or money order, click here. "Chat Room Therapy" is a chapter written regarding therapy done exclusively in a chat room and looks at both short and long term treatment. This book covers a wide range of topics concerning mental health and the Internet. It is due to be out in July 2002. Shavone Hamilton, an MSW student from Fordham (at the time) and I conducted part of our supervisory sessions in a chat room. This book includes that article. It also has a number of really good articles to help those who are in field placements. 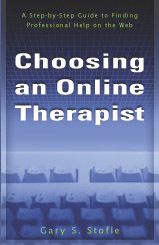 Thoughts about Online Psychotherapy examines the salient issues involved in online therapy (written in 1997).